Posted: May 1, 2018 in Obscurities, Who,What,Where & When...? Just yummy they are. The 246T had enough of everything to do the job, but not too much of it, including its wings. 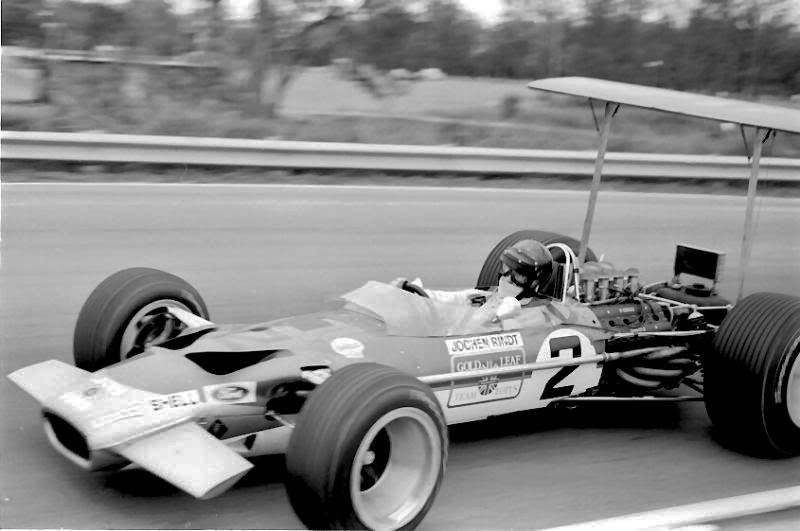 Amon didn’t race so equipped in 1968, his first Tasman Dino year, but wings exploded in F1 that season so he did return with these small aerodynamic aids in 1969, together with four 300 bhp V6’s to power the cars raced by he and Derek Bell that summer. They were works entries with logistics on the ground taken care of by David McKay’s Scuderia Veloce, Sydney based outfit. 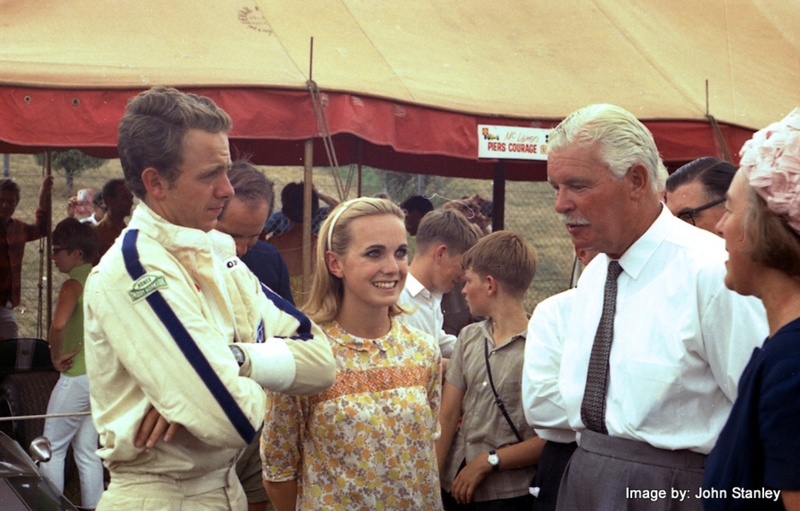 David and Chris went way back to 1962/3 when McKay’s support of him in a Cooper T53, and Chris’ speed in it that summer brought him to the attention of Reg Parnell- and off to Europe he went. 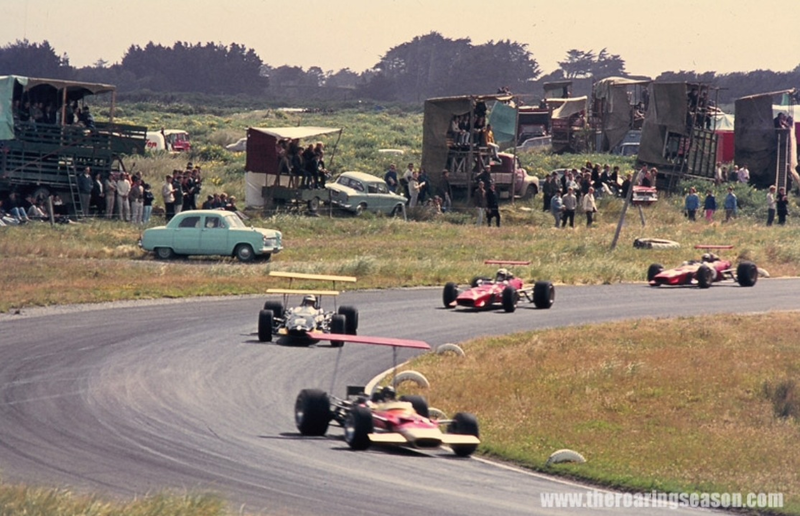 Chapman’s Lotuses returned to Australasia with World Champ Hill and World Champ Aspirant Rindt at the wheel in 1969. 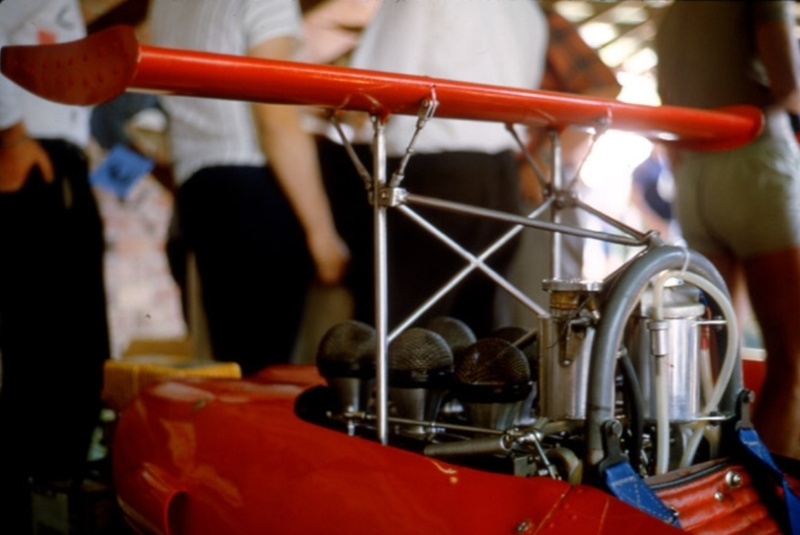 Colin’s Lotus 49 DFW ‘aero-phalluses’ were notable for their size and the regularity with which they parted company with the chassis to which they were, usually temporarily, attached. 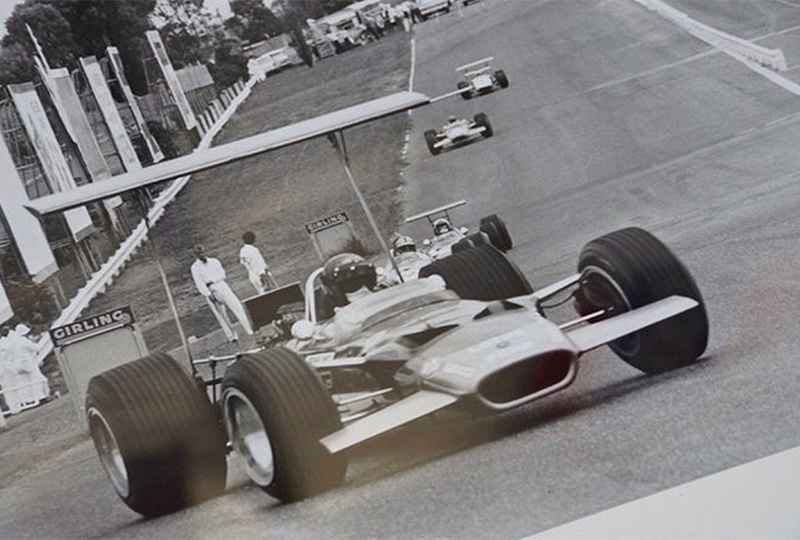 It was these component failures on both Lotuses at Montjuic Parc, Barcelona several months after the Tasman that caused the FIA to act, constraining the size of wings from the ’69 Monaco GP. Click here for an article in relation to those events. I am a complete Lotus nutbag but joisus Chappers should have been shot for the death and destruction caused to his drivers/customers by component failure over the years? The Latin term ‘caveat emptor’ could have been designed with Lotus purchase in mind. On the other hand, butch though the engineering sometimes was, the 1961/2 156 springs to mind- shite didn’t and doesn’t tend to fall off Ferraris. Look at (in the Pukekohe paddock photo above) the spidery, small, multi tube structure which supports the little wing. The mounts are triangulated and supported forward to the roll bar. The adjustment mechanism to alter the angle of incidence is simple and neat. The chord of the wing is shallow with endplates, not so common at the time, to ‘capture’ airflow. Note the throttle linkage, water and oil fillers and breathers, also the Willans harness attached to the roll bar. 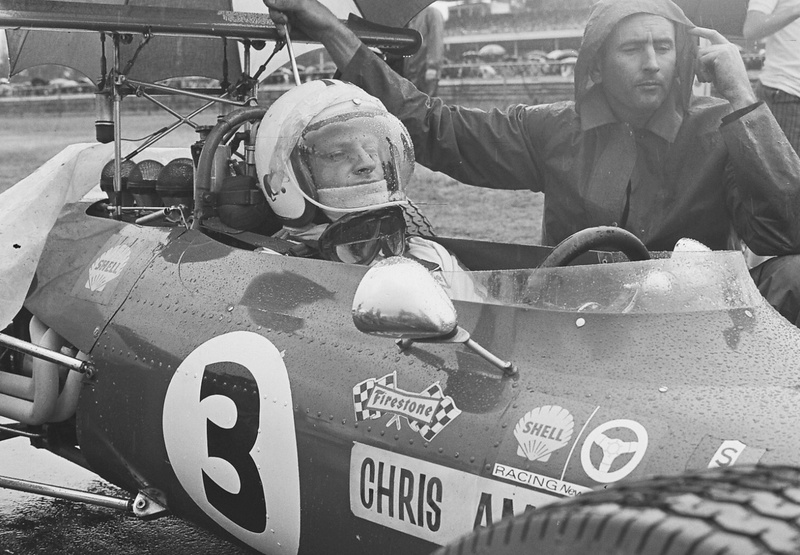 Chris took a great win in the ’69 Tasman, he won the first two rounds at Pukekohe and Levin after Rindt spun away the lead, before Jochen won on the Wigram airfield circuit. Piers Courage won at Teretonga in his bi-winged Brabham BT24 Ford DFW before the circus crossed the Tasman Sea to Australia. Chris won well at Lakeside, the Australian Grand Prix was run in very hot conditions- with both Lotuses suffering wing failure that weekend. 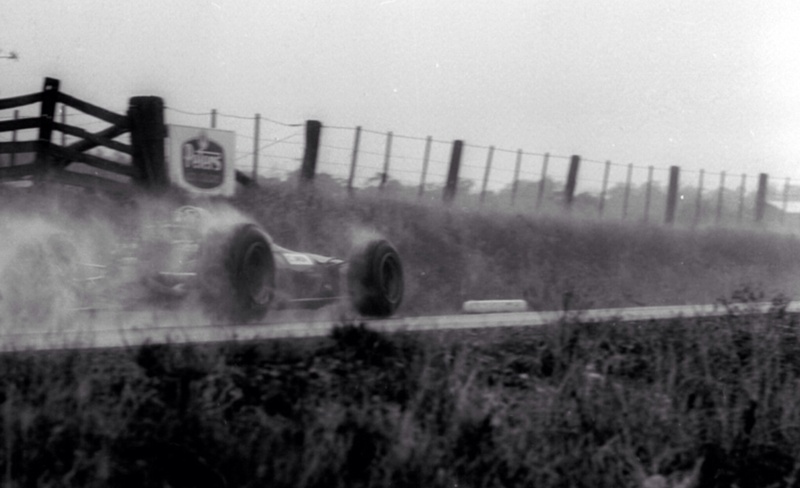 Jochen drove away from the field at Warwick Farm in streaming rain after Amon and Courage tangled early on. 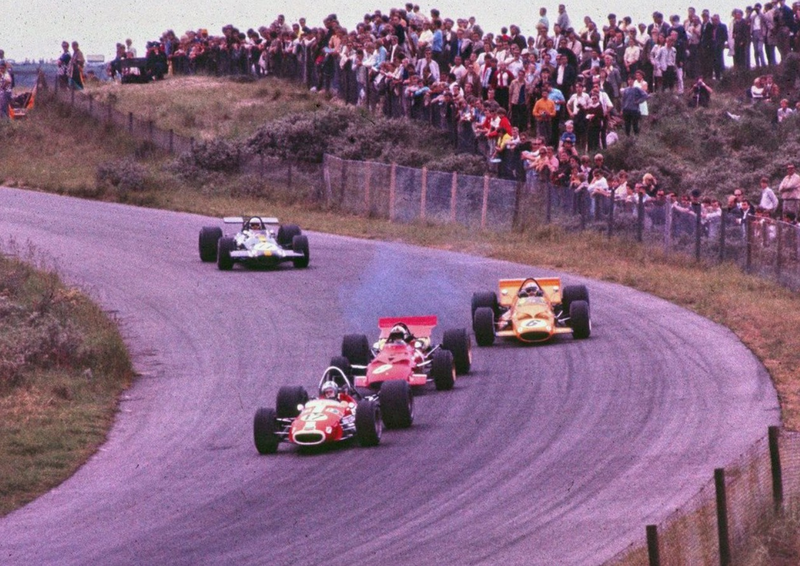 Chris won again at Sandown by 7 seconds from Rindt and took the series with 44 points from Rindt and Courage on 30 and 22 points respectively. The model is not bad either. This kinda stuff is a drivers stock in trade but the car organised is a bit low rent? Its Piers Courage’s Frank Willams Racing Brabham BT30 Ford FVA F2 car, BT30-5 i suspect. ‘Yerd reckon they could have rustled up one of those nice little F1 jobbies for the occasion? Jackie’s Championship winning Matra MS80 Ford or Piers’ Brabham BT26 Ford. Both must have been getting fettled for their next event. Jackie looks happy enough, as he should, its my kind of a days work. 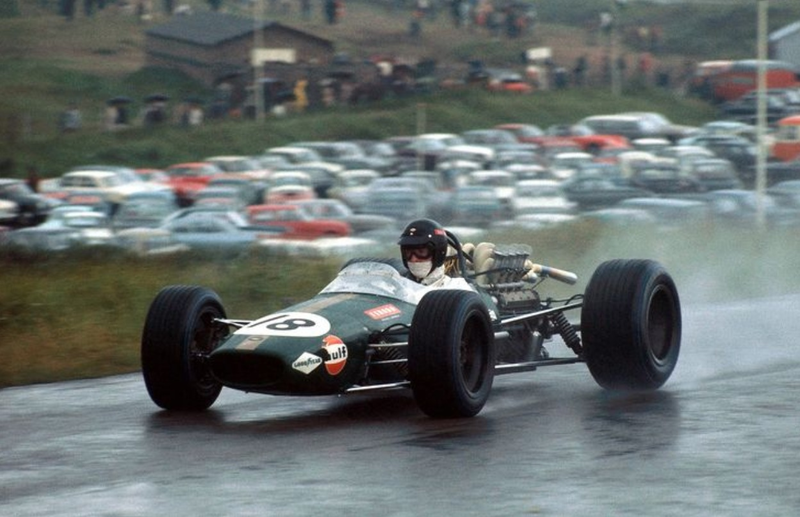 1969 was Piers Courage breakthrough year- he jumped out of the box in the Tasman Series, 3rd in the Series with a win at Teretonga, and was right up Rindt, Amons and Hill’s clacker in an FW Brabham BT24 Ford DFW. Then he absolutely brained ‘em in FW’s year old ex-works Brabham BT26, the Repco Brabham 860 V8 replaced by a good ole DFV. He was a front runner all year- 8th in the title with seconds at Monaco and Watkins Glen his best results. Chris Amon’s Ferrari Dino 246T chassis # ‘0008’ being warmed up prior to the start of the Teretonga International on 25 January 1969. 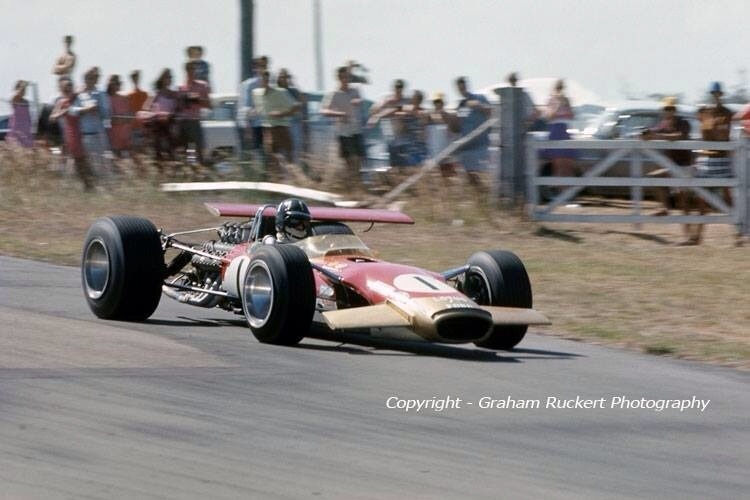 Chris was third in the race behind Piers Courage in Frank Williams Brabham BT24 Ford DFW and Graham Hill’s Gold Leaf TL Lotus 49 Ford DFW- and won the ’69 Series with wins at Pukekohe, Levin, Lakeside and Sandown. Just so ‘Ferrari in period’ this shot ‘innit? 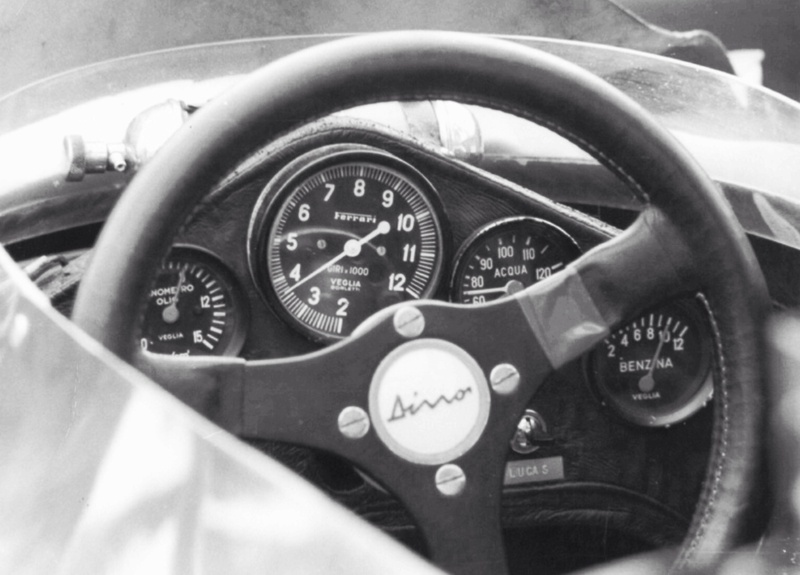 Veglia Borletti- Giri, Olio, Acqua and Benzina instruments and MoMo steering wheel- wouldn’t we all have loved to sit right here looking at this lot. Note the small fire extinguisher sitting above the dash and Lucas electrical fuel pump off-switch beside the fuel guage. I’ve done a few articles about Chris and the Dino, just pop the names into the primo site search engine on the home page for more ‘on topic’. Posted: January 19, 2018 in F1, Who,What,Where & When...? 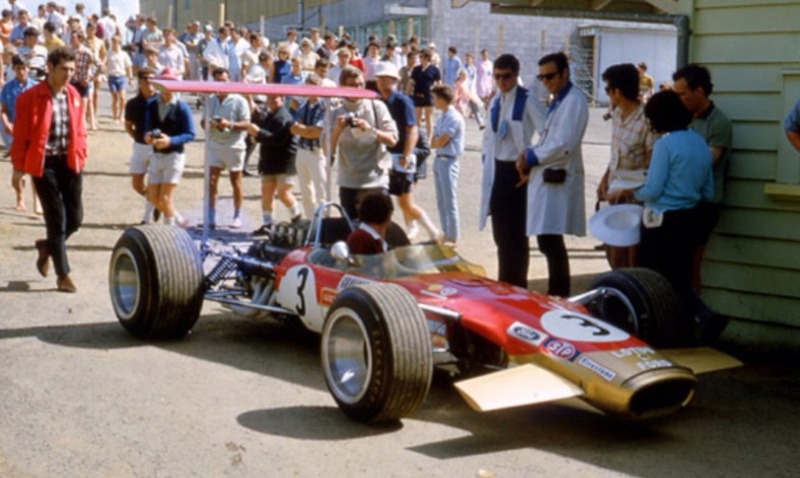 Alongside the Austrians Lotus 49B is Australian Niel Allen’s ex-Courage McLaren M4A Ford FVA F2, the bi-winged device behind Jochen is the Piers Courage Frank Williams owned Brabham BT24 Ford DFW. Jochen’s switched his engine off, as it tightened before it went ka-boom, having had problems in practice, on lap 43 whilst in third. Niel was 5th and Piers had an accident on lap 5 after a passing move on Graham Hill went pear-shaped at BMC bend. Chris Amon won in his works Ferrari 246T Dino. Allen Brown’s summary of the 1969 Tasman Series is a great one, it says a lot in the minimum number of words. I like that! ‘Chris Amon was back for 1969 and taking it much more seriously with two Ferrari 246T/69s for himself and teammate Derek Bell and four 300 bhp 24-valve engines. Despite the loss of Jim Clark, Lotus were present with a two-car team of Lotus 49Bs for Graham Hill and new teammate Jochen Rindt. 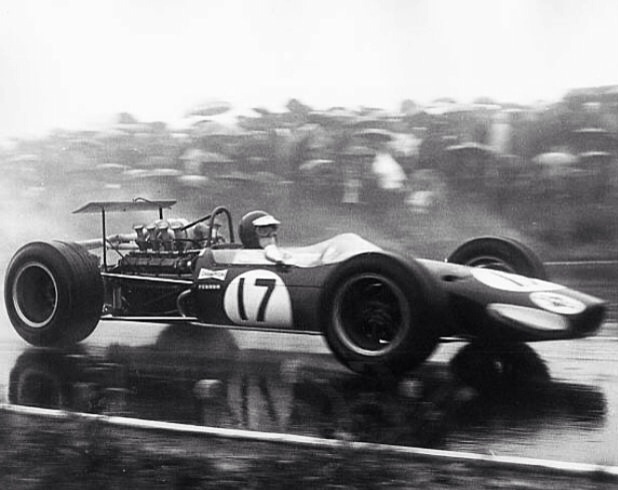 BRM did not enter so the only other overseas entry was Frank Williams who had a Brabham BT24 for Piers Courage’. 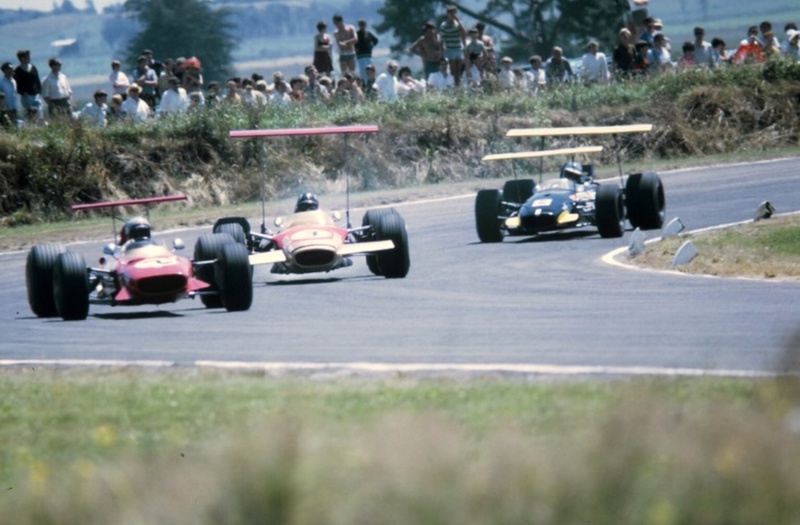 ‘Rindt proved to be Amon’s closest rival but spun away the lead at both Pukekohe and Levin, leaving Amon to win both races, before the Austrian took a comfortabe win at Wigram. 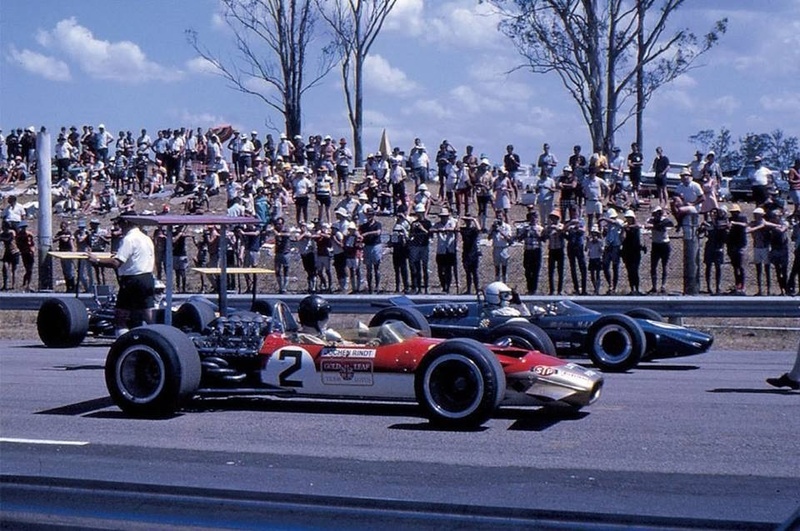 A dominant victory at Lakeside’s Australian GP for Amon meant Rindt could no longer catch him and when Amon and Courage tangled at Warwick Farm, the Kiwi was champion’. 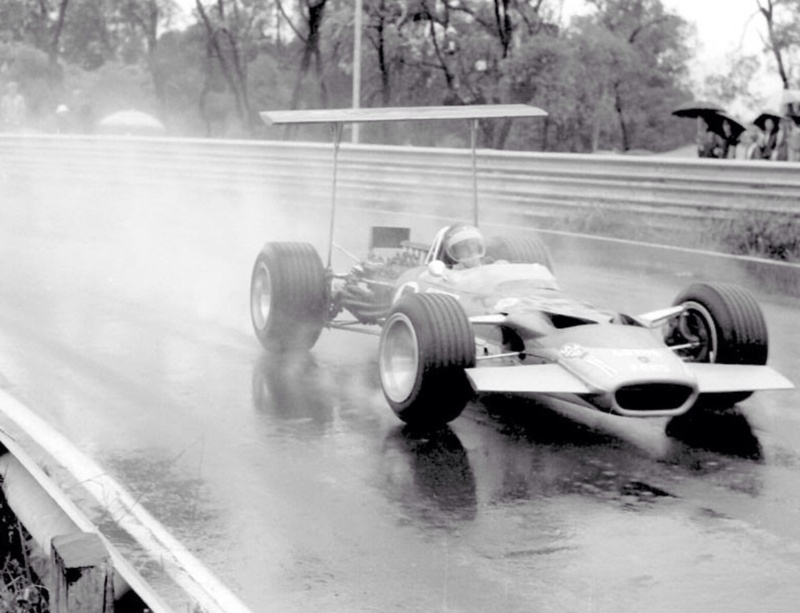 Rindt had a stunning weekend in both practice and an amazing wet weather drive which blew the minds of the Sydney spectators and his rivals. ‘He (Amon) rounded off the season with victory at Sandown, his sixth in two seasons’. Now that the visiting British teams were using F1 cars and then taking them home, there was no longer the annual influx of new machinery for the locals. Alec Mildren had the funding necessary to commission specials but the number of competitive 2.5-litre cars was definitely dropping. David McKay’s Scuderia Veloce was the nominal entrant of Amon’s Ferraris but no longer ran their own car. This season, Mildren had installed his Alfa V8 in a car designed for him by Len Bailey and constructed by Alan Mann Racing in England’(the monocoque Mildren Alfa ‘Yellow Submarine in addition to his ’68 Tasman Special, the Brabham BT23D Alfa driven by Kevin Bartlett’). 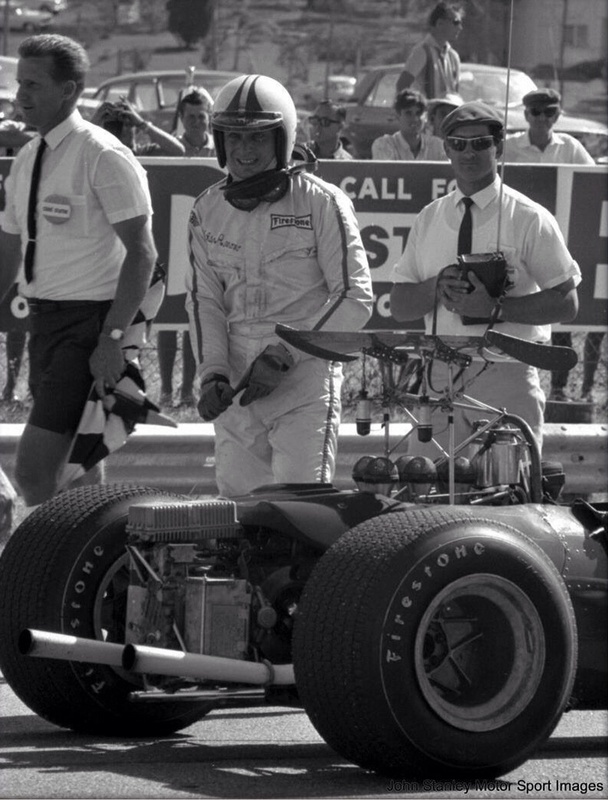 Chris Amon readies himself and his Ferrari Dino 246T before the first round of the 1968 Tasman Series, a race in which he wonderfully and deservedly triumphed. 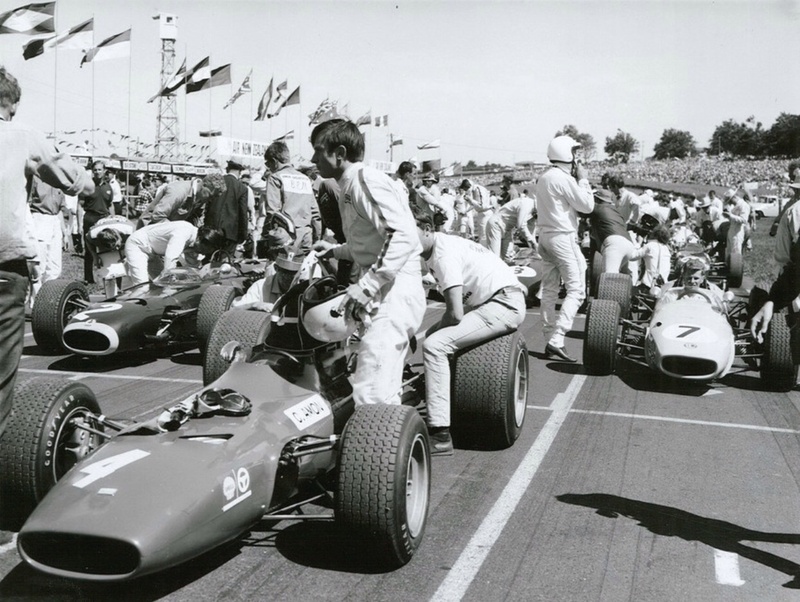 Missing on the front row is Jim Clark’s Lotus 49T Ford DFW. Car #2 is Pedro Rodriguez’ BRM P261, the Mexican is bent over the cockpit of his car but failed to finish with clutch problems. Car #7 is Alec Mildren’s Brabham BT23D Alfa Romeo T33 2.5 V8 with chief mechanic Glenn Abbey warming up the one-off car. Lanky Franky Gardner is adjusting his helmet beside the car, it was a good day for Frank, the car was second. 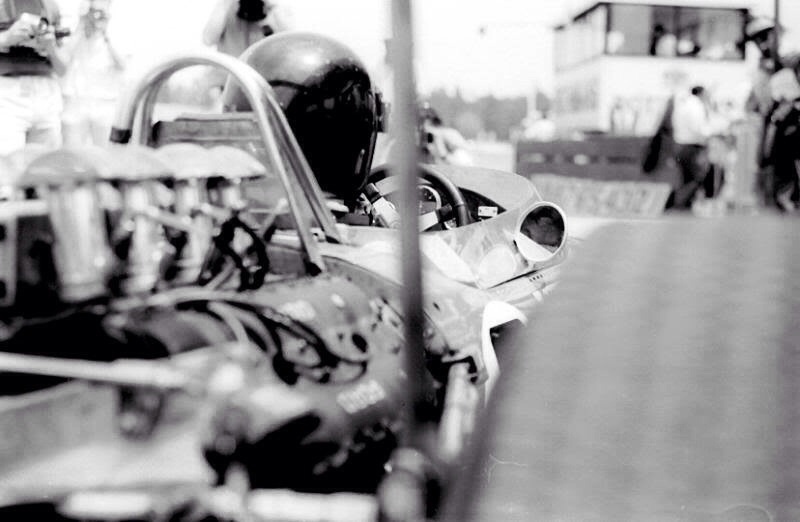 Look closely and you can see a camera crew behind the Brabham which is focusing on 1967 reigning world champion Denny Hulme and his #3 Brabham BT23 Ford FVA F2 car- Denny’s head is obscured by Frank’s body. 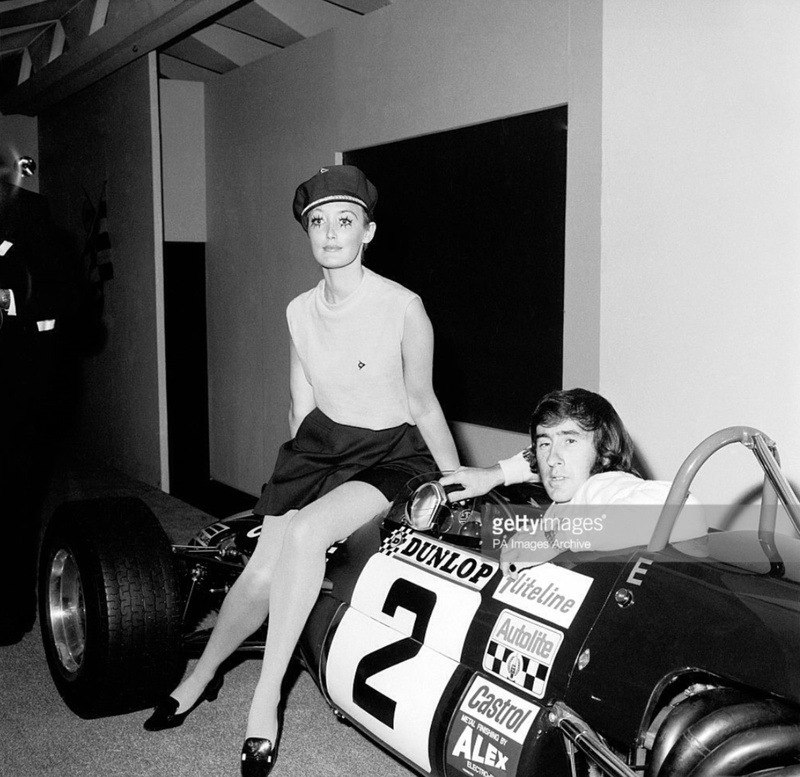 Hume boofed the ex-Rindt BT23 during the race badly enough for a replacement chassis to be shipped out from the UK. 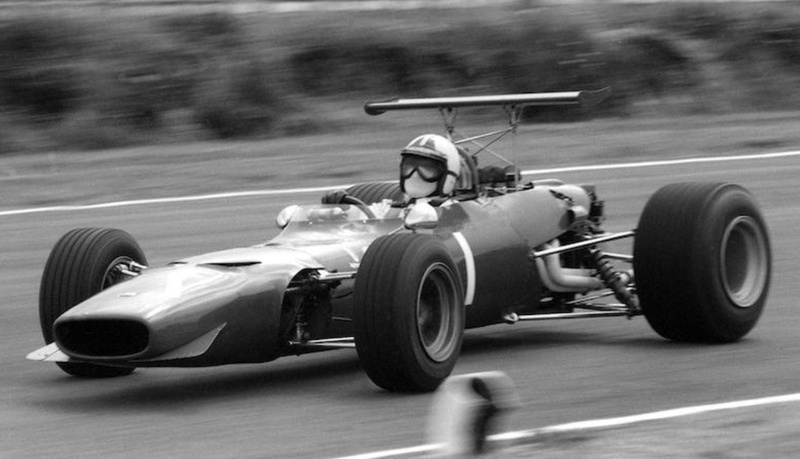 I’ve always thought these F2/Tasman Ferrari’s amongst the sexiest of sixties single-seaters. The 166 F2 car was not especially successful amongst the hordes of Ford Cosworth Ford FVA engined cars in Euro F2 racing. However, the car formed the basis of a very competitive Tasman 2.5 litre Formula car when fitted with updated variants of the Vittorio Jano designed V6 which first raced in F2 form and then owered the late fifties Grand Prix racing front-engined Ferrari Dino 246. It was in one of these cars that Mike Hawthorn won the 1958 World Drivers Championship. 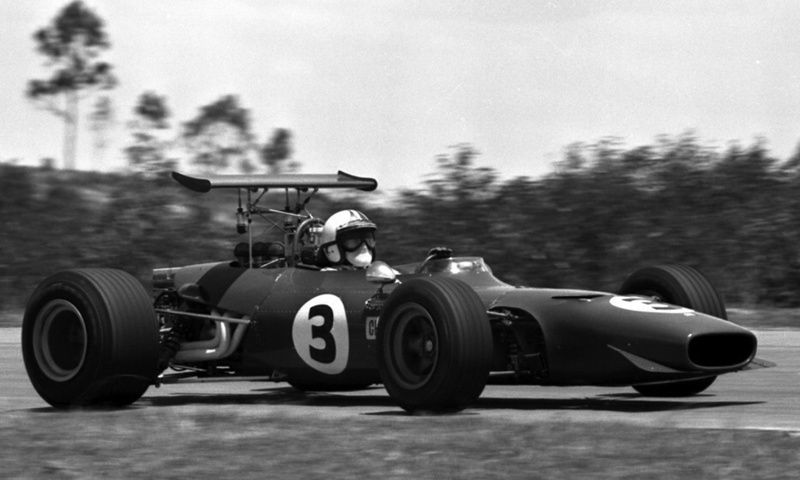 Amon won the Tasman Series in 1969 with Ferrari Dino 246T chassis #0008 with fellow Kiwi Champion Graeme Lawrence winning in the same car in 1970 against vastly more powerful, if far less developed Formula 5000 cars. The story of those championships is for another time, this article is about Chris’ 1968 Tasman mount and campaign. Ferrari entered only one car that year with chassis #0004 assembled in Maranello by longtime Amon personal mechanic Roger Bailey and tested at Modena in November 1967. It was then freighted by plane to New Zealand where it was assembled by Bruce Wilson in his Hunterville workshop in the south of the North Island. The cars chassis was Ferrari’s period typical ‘aero monocoque’, a ‘scaled down’ version of the contemporary F1 Ferrari with aluminium sheet riveted to a tubular steel frame forming a very stiff structure. The 166 was launched to the adoring Italian public at the Turin Motor Show in February 1967. In F2 form the 1596cc, quad cam, chain driven, 18 valve, Lucas injected engine developed circa 200bhp at an ear-splitting 10000 rpm. It is important to note that this F2 engine, designed by Franco Rocchi, and in production form powering the Fiat Dino, Ferrari Dino 206 and 246GT and Lancia Stratos is a different engine family to the Jano designed engines, evolved by Rocchi, used on the Tasman Dino’s. The F2 166 made its race debut in Jonathon Williams hands at Rouen in July 1967, and whilst it handled and braked well it was around 15bhp down on the Cosworth engined opposition. Whilst the car was tested extensively at Modena, including 24 valve variants, it was not raced again that year. 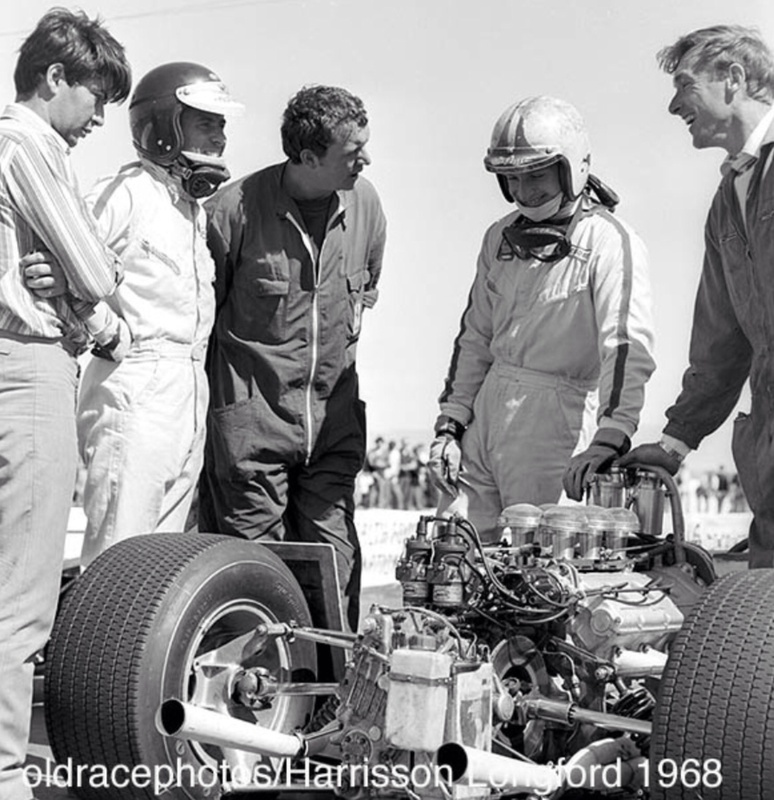 Amon, who had not raced in the Tasman Series since 1964, could immediately see the potential of the car, suitably re-engined, as a Tasman contender given the success of the small, ex-F1 BRM P261 1.9-2.1 litre V8’s in the 1966 and 1967 Tasman Series. The same approach which worked for the boys from Bourne could also work in Maranello Chris figured. A parts-bin special is way too crass, but you get my drift of a very clever amalgam of existing, proven hardware as a potential winning car. 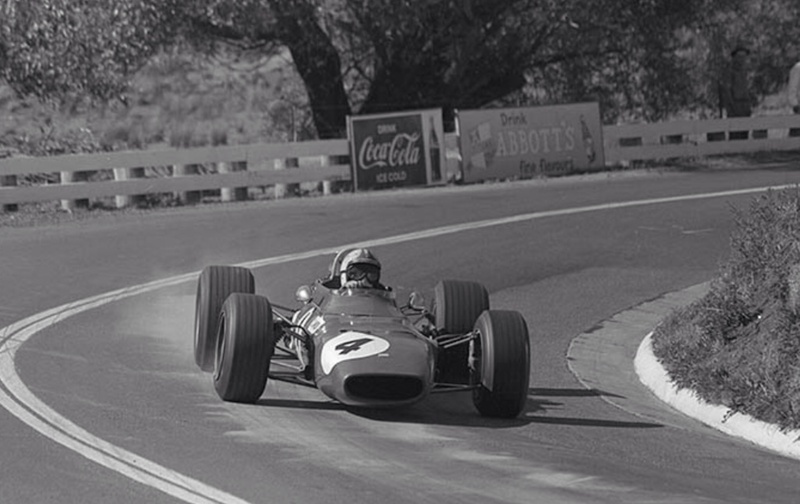 In fact Ferrari went down this path in 1965 when a Tasman hybrid of a then current F1 chassis was married to a 2417cc variant of the Jano 65 degree V6 for John Surtees to race in the 1966 Tasman. John had Tasman experience in Coventry Climax FPF engined Coopers and Lola’s at the dawn of the sixties and could see the potential of a small Ferrari. That plan come to nothing when Surtees was very badly injured in a Mosport Can Am accident in his self run Lola T70 Chev in late 1965. This car, Ferrari Aero chassis ‘0006’ played the valuable role of proving Surtees rehabilitation when he completed 50 laps in the car at Modena. 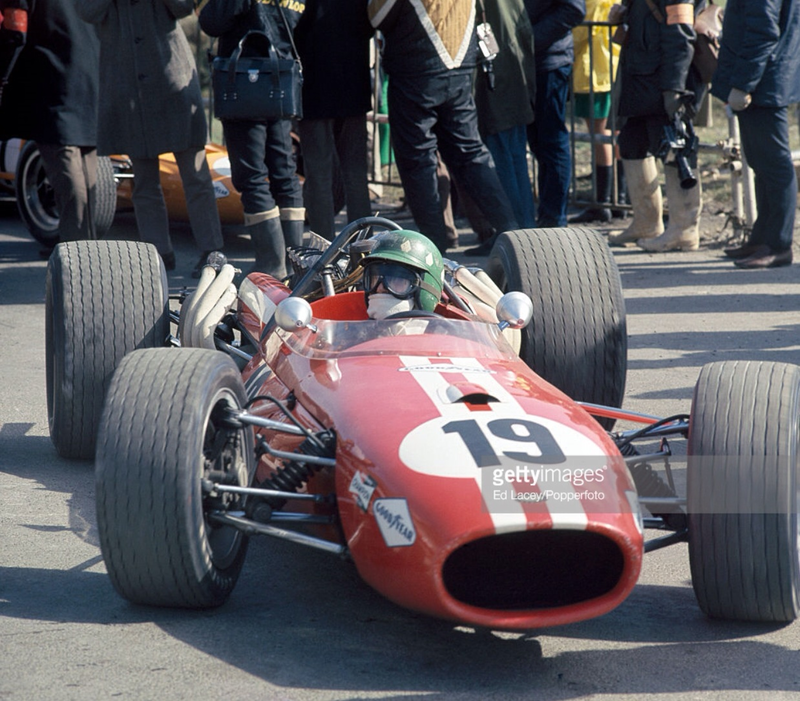 It was in the same chassis that Lorenzo Bandini finished 2nd in the 1966 Syracuse and Monaco GP’s as Ferrari sought to get the new 3 litre V12 F1 312 up to speed, Bandini electing to race the Dino on both occasions. He also finished 3rd aboard the car at Spa. 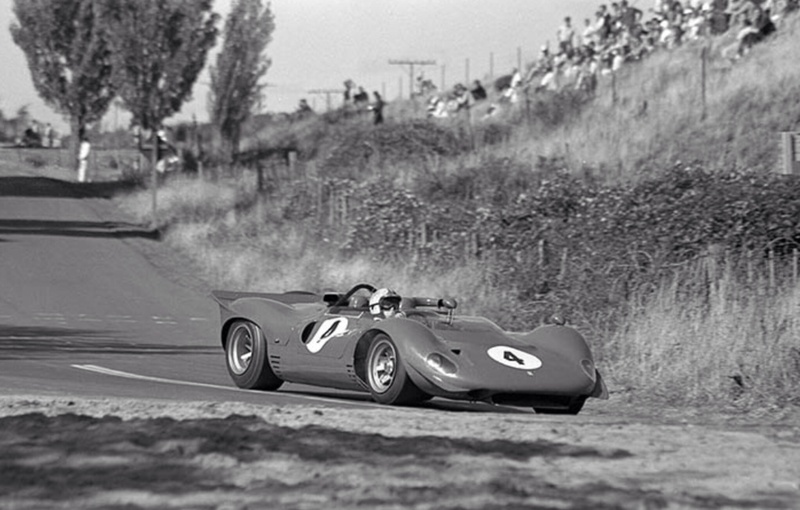 The allocation of this more competitive car to Bandini rather than team-leader Surtees was amongst the many issues which lead to the confrontation between John Surtees and team manager Eugenio Dragoni during Le Mans practice and Surtees departure from the team. The engine of the 166/246T was carried in a tubular subframe attached to the rear of the monocoque which terminated at the drivers bulkhead. The car was fitted with a 5 speed transaxle designed by Ingenere Salvarani and Girling disc brakes. 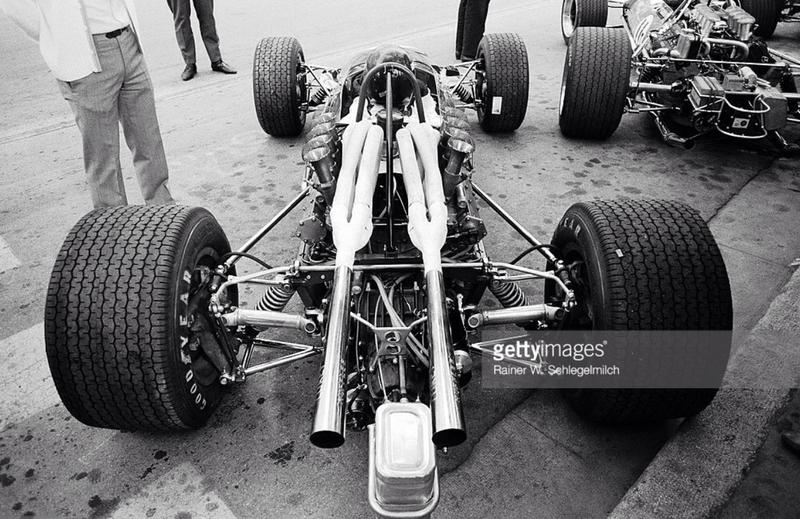 Suspension was also similar to the contemporary F1 cars in having an front upper rocker and lower wishbone with inboard mounted spring/shocks and conventional outboard suspension at the rear- single top link, inverted lower wishbone, two radius rods and coil spring/shocks. 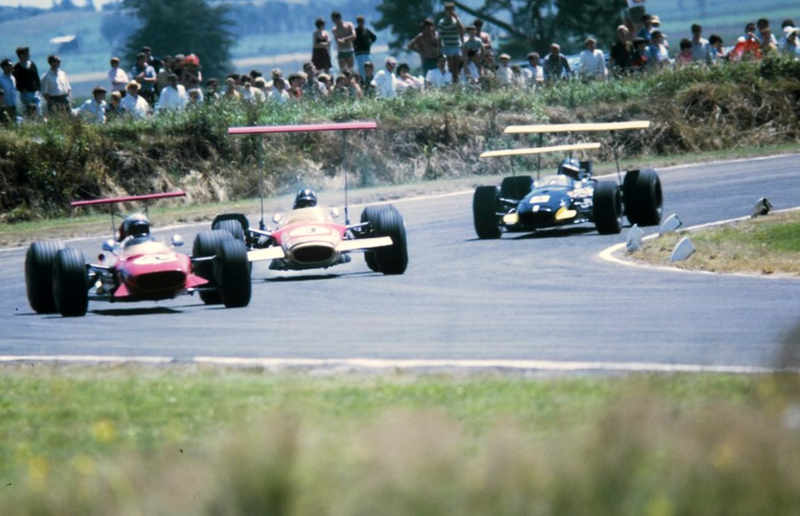 For the 1968 NZ races- Chris won at Pukekohe after Clark retired and at Levin, leading from flag to flag, was 2nd to Clark at Wigram and 4th at Teretonga- a 3 valve variant (2 inlet, 1 exhaust) of the 65 degree fuel injected V6 was fitted which was said to develop around 285bhp @ 8900rpm from its 2404cc. Chris crossed the Tasman Sea with a 9 point lead in the Series from Clark and the might of Team Lotus. It was a wonderful effort, whilst Ferrari provided the car free of charge, and took a share of the prize money, the logistics were of Chris’ own small equipe. And here they were serving it up to Gold Leaf Team Lotus with a couple of World Champions on the strength, plenty of spares and support crew. For the four Australian races a 24 valve version of the engine was shipped from Maranello. Its Lucas injection was located between the engines Vee rather than between the camshafts and had one, rather than two plugs per cylinder. This engine developed 20 bhp more than the 18 valver with Chris promptly putting the car on pole at Surfers Paradise, a power circuit. He won the preliminary race and had a head seal fail whilst challenging Clark in the championship race. At Warwick Farm he qualified with the 18 valve engine and raced the 24 valver having rebuilt it- they only had one of the motors. He was challenging both Clark and Hill in the race and then spun in avoidance of Hill who was having his own moment…he was 4th on the tight technical Sydney circuit. At Sandown during the AGP, the pace of the car, and Amon, was proved in an absolute thriller of a race in which he finished 2nd to Clark- let’s not forget the best driver in the world driving the best F1 car of the era powered by the Tasman variant of the greatest GP engine ever- and took fastest lap. As the team crossed Bass Straight from Port Melbourne on the ‘Princess of Tasmania’ Chris knew he had to win the Longford ‘South Pacific Championship’, with Clark finishing no better than 5th to win the Tasman title. At Longford, still fitted with the 24 valve engine, which must have been getting a little tired, he qualified a second adrift of Clark and Hill. He finished 7th in a race run in atrocious conditions on the most unforgiving of Australian circuits having initially run 2nd to Clark but then went up the Newry Corner escape road and suffered ignition problems from lap 10. Piers Courage won in an heroic drive aboard his little McLaren M4A Ford FVA F2 car that streaming day, in a series which re-ignited his career. Chris was a busy boy during the Australian Tasman leg as he also drove David McKay’s Scuderia Veloce Ferrari 350 CanAm/P4 in sports car support events at each round in addition to the little Dino. 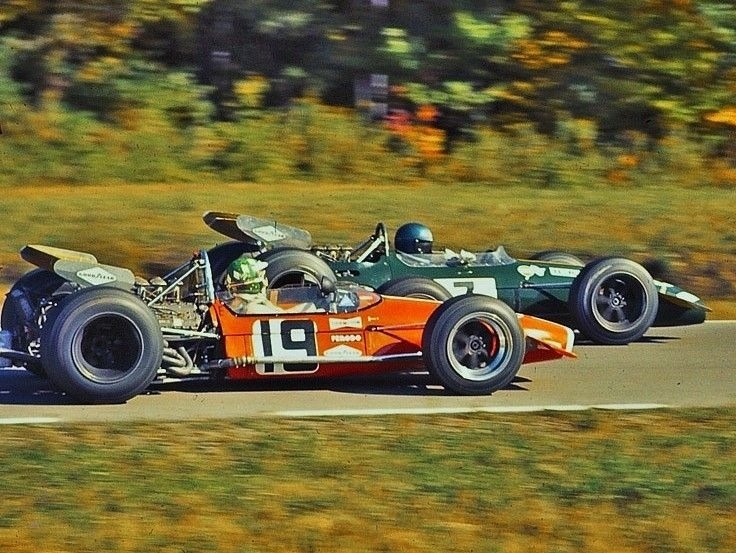 These races were outstanding as they all involved close dices between Chris and Frank Matich in his self designed and built Matich SR3 powered by 4.4 litre Repco Brabham ‘RB740’ V8’s- with Frank getting the better of him in each of these races. The speed of the Matich was no surprise to Chris though, both had contested rounds of the Can Am Championship only months before the Tasman in the US. 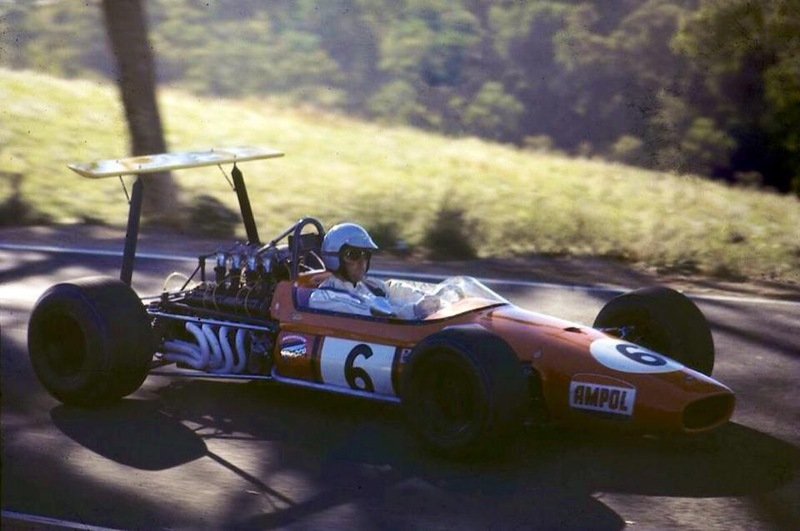 For the ’69 Tasman Chris applied all he learned in 1968 returning with two cars, the other driven by Derek Bell, four well developed 300bhp 24 valve engines with the logistics taken care of by David McKay’s Scuderia Veloce.